Great stuff for employers, employees, parents, teenagers, and just about anyone else who is an introvert, extrovert, or anything else. Tags: Relationships, management, human resources, entrepreneurship, parenting, working with others, human potential. You’re an introvert who wants to do great things. You have an employee who is an introvert, and you know he/she is capable of great things and you want to know how to assist him/her. You have a child who is an introvert, and you know he/she is capable of great things and you want to know how to assist him/her. You’re tired of loud people getting all the credit. You’re a human being and you interact with other human beings. Remember how satisfying it was to read Good to Great and learn that the best leaders aren’t loudmouthed, swaggering, boastful, arrogant jerks, but quiet and humble men and women of principle? You’ll get a similar boost from Quiet by Susan Cain. 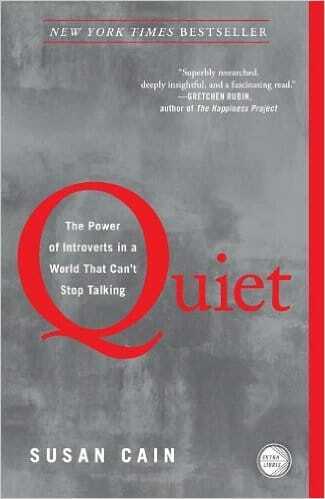 Cain has researched the history of extroverts, explains why we tend to listen to and trust them more than introverts, why this is a mistake, and shows us how important it is for us to listen to and involve introverts without attempting to force them to become extroverts. It’s a well researched book, full of new stories I’ve never heard before (I have a strong dislike for derivative works that merely rehash what everyone else is saying–this book is almost 100% unique and new material), based on data and science, not just theory and conjecture, and will change the way you view yourself and others. I found it relevant because I am an introvert at heart, but live in the world of entrepreneurship and startups and media where, in order for my business to succeed, I have to be constantly in front of people writing articles, speaking, pitching, and presenting. I’m a parent with children who are introverted, at least sometimes. But I also found it relevant to just about every other relationship I have, because everyone is somewhat an introvert, somewhat an extrovert, and now I know better how to work with both, which means I’m better at working with everyone.